Begin with a single cell and watch as mitosis and cell division occurs. The cells will go through the steps of interphase, prophase, metaphase, anaphase, telophase, and cytokinesis. The length of the cell cycle can be controlled, and data related to the number of cells present and their current phase can be recorded. Modified the Student Exploration for low performing students. 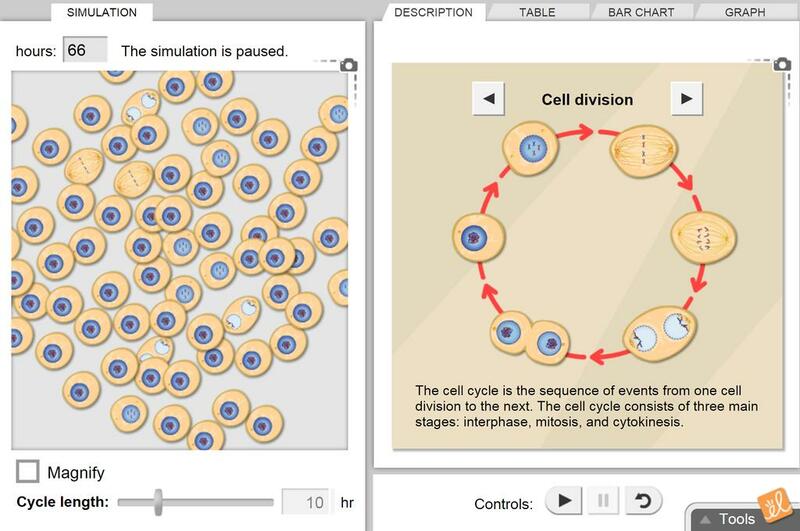 You can find many sites that simulate mitosis, but this is the only simulation I've see where a student can perform an experiment. It is a great way to learn and have fun. I like how you can interact how the cells move and control the bar graph. This Gizmo is A+. You really ought to try it. This Gizmo was great i absolutely LOVEEEE it !!!! This gizmo really helped my 8th graders understand the steps of mitosis. It was really indepth and made them think about what was happening.